Welcome to Bizarro's world.....Bicasso takes us on a ride of what his life is like. Very dope. One thing I admire about B-I-C is that he doesn't stick within the boundaries of 'HipHop'. He freaks it like nobody else. Straight funkjazzhop is what I call his music. Whatever you want to call it, it's bangin!!! 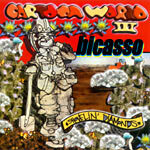 All beats by Bicasso for dirtworksart. David Goodlett: guitar on track 3. Gavin: flute on track 9. Bicasso: trumpet on track 9.